How do Veterans Define Success? Real veterans talk about finding success in the Sunshine State. It’s been said that the road to success is often times filled with obstacles. Well, here’s some advice: forget everything that’s been said. The road to success is practically an obstacle course, filled with the most unbelievably difficult challenges you’ll likely ever face. Oh, and there’s no real road to follow either—that’s just a myth. So, it’d behoove you to prepare now for an unbeaten and uncertain path. Listen, no one ever said it was going to be easy. The truth is that it’s even more difficult when you’re trying to figure out where and how you should move forward, especially after leaving so much behind. The military’s a huge part of every veteran’s life, but it’s not the be all and end all. When an enlistment or career ends, the time to start putting your skills to work in the civilian world starts immediately. The real question is, where exactly do you start? Well, the answer might surprise you—because sometimes it’s not where you start; it’s where you decide to go. For Bryan Jacobs that meant making the move to Florida. Bryan, a former Navy Corpsman and OIF veteran, earned a double master’s degree. But he didn’t stop there. 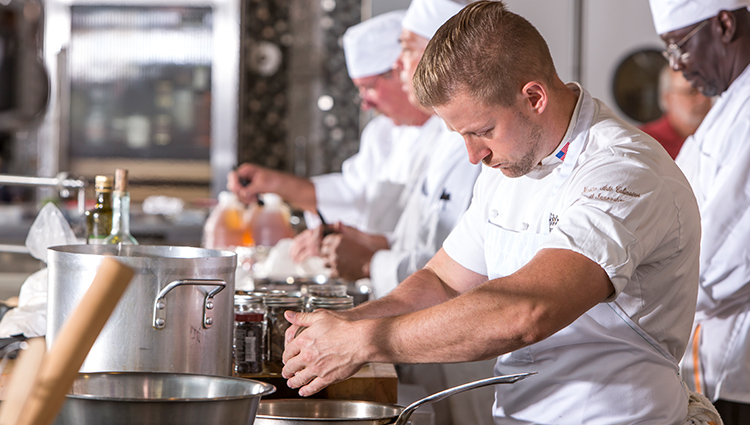 He then started Vets2Chef, a non-profit dedicated to teaching veterans the skills they need to break into the culinary industry. Veterans Florida sat down with Bryan to hear about how he’s found post-military success here in the Sunshine State. Veterans Florida: Hey, what’s up Bryan? Can you tell us a little bit about yourself? Bryan: Well, I served in the United States Navy from August 1999 to November 25, 2005. I was stationed in Second Marine Division, Second Light Armored Reconnaissance Battalion in Camp Lejeune, North Carolina. VF: That’s awesome. We all know hitting the fleet can be a challenge. Tell us what it was like as a young Corpsman. What were some of your first experiences like? Bryan: It was weird because in the Navy we have Petty Officers, so I had never come in contact with a Corporal. I had no clue what a Corporal was. Well, it was day one, clean up, 18:00 and we had formation. We had to do a deck walk. I said something like, “This is stupid.” This Corporal who was standing next to me, he was the guy that was leading field day. I mean, I had no clue what a field day was really about in the Marine Corps, so when I said it was stupid, I immediately had that Corporal remind me of where I was and how things were going to go from now on. It was pretty intense. VF: Corporal really is such a different rank in the Marine Corps. Alright, so we’ve all had our experiences serving, but really, it’s after we’ve finished our military service that we find some of the real challenges start. That’s when we begin questioning what we should do next. What was your experience like with that? Bryan: I was lucky in the sense of my journey, in that food found me at a very young age. That was from my grandfather. I don’t know, if food hadn’t found me or called back to me, I wouldn’t be in the place I’m at. But, I feel like there’s something about being grounded and going back to your roots in life that brings back this vision of not necessarily who you were prior to the military, but who you could be now based upon that old version of yourself. Doing Big Things in Florida. VF: That’s such an awesome perspective, and so true. How exactly did you end up here in Florida? Bryan: Florida’s all about opportunity. Florida happened to be the opportunity of my life. When I came to Florida it was really like things just happened. It was all about being next to the right people. It kind of reminded me of being back in the military. I remember going to my first VSO [Veteran Service Officer] here, and they pointed me to the next direction, to the next person I needed to meet. It was great; this person knew that person, that person directed me towards another person and, along the way, everyone was looking out for me. VF: So, would you say there’s a pretty strong Veterans presence or a community in Florida? Bryan: I’ve lived all over the East coast. I’ve even lived in the North East and I wouldn’t be able to do what I’m doing now if it wasn’t for a strong Veteran community support system. VF: Your program is called Vets 2 Success. Define success. Bryan: Success is changing your life for the better. That’s what we’re about at Vets 2 Success. We’re giving Veterans an opportunity to find the same kind of passion and purpose in their civilian lives that they had in the military. Putting themselves back around brothers and sisters and going forth as a new fire team, with a new mission. That’s what we’re finding success in. VF: When you see someone who’s gone through your program, graduated on to become successful, what’s that like? Bryan: It’s amazing. I remember one Veteran in particular. I mean, this guy was sleeping in a car at the time. He was working two jobs and he still couldn’t make ends meet. He couldn’t get into an apartment, had bad credit; he was a mess. Well, he came to Vets 2 Success, worked extremely hard, and made it through the program. This guy now has a wife, a kid; he’s a Sous Chef at a great restaurant, he’s got two cars and a house. He’s made it, and now he’s asking, “how can I give back?” When someone comes back and asks how they can now give back—that’s when I know their life has changed. That’s when we’ve achieved our mission. That’s success. VF: It’s a cycle of success. Bryan: Exactly. So, Veterans will lead veterans to success. That’s what it’s all about. VF: Thanks Bryan. Best of luck with Vets 2 Success. We all have a unique path to choose in life. There are tough decisions to make, and opportunities along the way to create the best possible lives for ourselves and our families. As veterans, we’ve been trained to perform under pressure, to push through challenges and to put the work in to achieve the goals we’ve set. The skills are there; sometimes all we’re waiting for is the right opportunity to put them to use. Veterans Florida has exclusive resources designed to help veterans create those opportunities right here in Florida. Resources like our Entrepreneurship Training Program, which offers free online and on-campus courses that teach veterans everything needed to start a business. So, what are your goals? And how are you going to achieve them? Follow the road to Florida and start to see what’s possible. Real Veterans, real success. That’s Veterans Florida. This entry was posted in Entrepreneurship, Learn, News, Work. Bookmark the permalink.